Anré Williams is President of American Express' Global Merchant Services (GMS) & Loyalty Group. He has served as President of GMS since November 2011, leading the organization that manages the relationships with the millions of merchants around the world that accept American Express. The GMS business serves as an acquirer, processor and marketing partner for merchants of all sizes, including small, regional, and global businesses. In October 2015, Mr. Williams took on additional responsibility, overseeing Global Loyalty Coalition, which includes the U.S. Plenti and international Payback rewards programs, and Global Network Business, which runs the Company’s payments network and develops networkrelated products and services. In 2016, the worldwide Billed Business volume processed by the merchant network was $1.04 trillion. 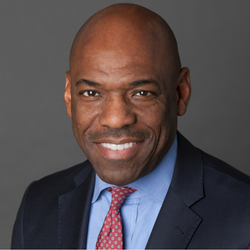 Mr. Williams is a member of American Express’ Officers’ Group, which is responsible for developing the company's strategic direction and determining key policies affecting the company overall. Mr. Williams began his career at American Express in 1990 in marketing roles that focused on offering unique services to college students and subsequently to Platinum Card members. He then joined the Small Business division, where he led new product development, supervised the launch of seven new products and services in a two-year period, and spearheaded the division’s advertising efforts. He joined the Corporate Payments division in 1999, and was promoted to roles of increasing responsibility, including Executive Vice President of U.S. Commercial Card and later President, Global Corporate Payments. As President, he had overall P&L responsibility for the division that markets the American Express Corporate Card, Corporate Purchasing Solutions and other payment products to mid-size companies and large corporations around the world. Mr. Williams serves on the Board of Illinois Tool Works Inc. He is co-chair of the U.S. Travel Association CEO Roundtable, and a member of the Stanford Athletics Board and the USA Track & Field Foundation Board. He earned his BA from Stanford University and his MBA from the Wharton School at the University of Pennsylvania. He resides in South Orange, NJ with his wife, Paula, and their two children.